The Good: Roku TV delivers the best smart-TV experience on the market. A superb user interface makes its thousands of apps and streaming video easy to use from the TV’s own simple remote. It’s also less expensive and more frequently updated than just about any other smart TV. The Bad: No Ethernet port. The largest, 49-inch size isn’t as good a value as the others. The Bottom Line: If you’re looking for an affordable small TV, the Roku-powered TCL S305 series should be your first choice. Here’s the thing about small TVs: Their picture quality is pretty much all the same. TV manufacturers tend to pour their effort and latest image-enhancing extras like 4Kand HDR into larger models that will be used in more demanding viewing environments, and incidentally can be sold for a higher profit. In the world of small, bedroom-sized TVs — I’m talking 43 inches and smaller — the focus is on reducing cost to hit a price point. So what separates a good small TV from the pack? In my book it’s convenience and ease of use, and nobody does that better than Roku TVs. 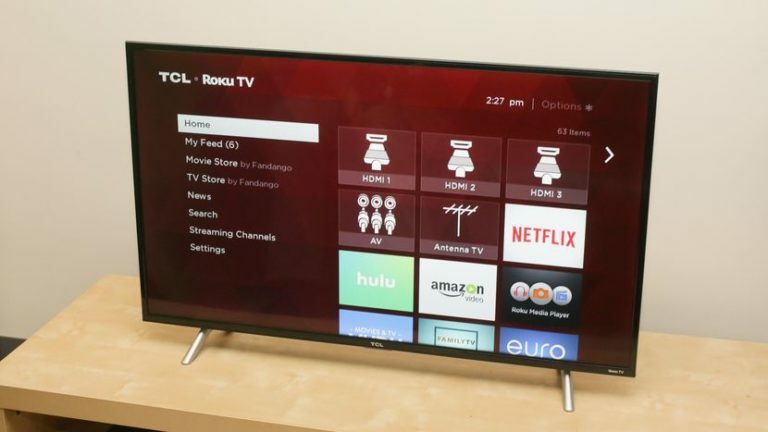 Chinese TV maker TCL is the leader in televisions powered by the Roku operating system, the same one found in my favorite external streaming devices. Roku streaming, complete with thousands of apps and a dead-simple menu system, is built right into the TV, and everything is controlled by one remote. The fact that you don’t have to connect an external streaming device, combined with their dirt-cheap prices, makes TCL’s S305 series our go-to budget budget pick at modest screen sizes. Its closest competitor is Vizio with its D series or the 43-inch member of the E series, but Vizio’s Smart TV system is significantly worse. I didn’t review any of those smaller Vizios this year, but based on what I’ve seen in the past, their image quality is close enough to this TCL’s that it doesn’t make a difference. 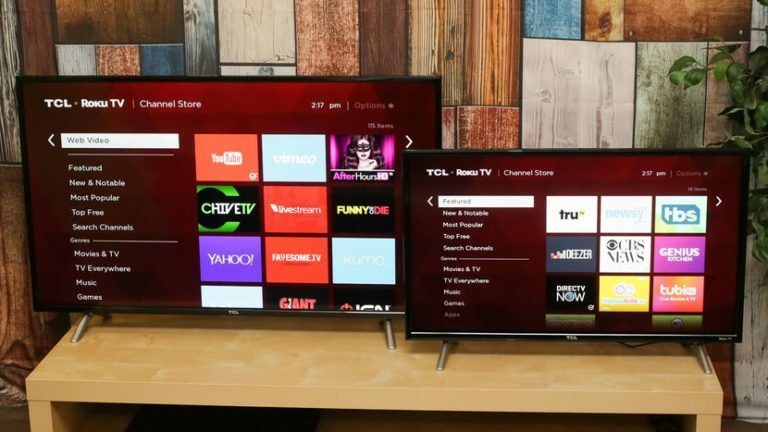 TCL’s sets are bare-bones, with a thin, glossy black frame and prominent logos, including one for TCL and another for Roku along the bottom. Silver legs to either side keep the TV upright. I like Roku’s simple remote for TVs. It’s tiny, with just a few buttons, and unless you dial in channel numbers from an antenna you probably won’t miss the absent ones. Unfortunately its central directional cursor has a cheaper feel than Roku’s device remote, with every press emitting a hollow click. The volume control/mute are side-mounted and the shortcut key varies. Both the 32- and 43-inch remotes had Netflix and Sling TV, but on the 32-inch there were also shortcuts Hulu and Starz, while the 43-inch got Amazon and CBS News. Simplicity and customization reign with Roku’s menu design. The main difference between its streaming devices and its TVs is the handful of icons along the top of the main home screen, like “Antenna TV,” “DVR,” “Blu-Ray player” and “HDMI 3.” You’ll choose a name and icon for your connected gadget during the setup process, and you can easily change it later or hide unused inputs. Roku TVs have access to all the thousands of apps found on Roku’s platform, which still offers better coverage than any competitor, smart TV or otherwise. Netflix, Amazon, YouTube, Hulu, Plex, HBO Now, Showtime, Sling TV, PlayStation Vue, Vudu, Google Play Movies and TV, Watch ESPN, Fox Sports Now, FX Now, Comedy Central, Starz, PBS Kids…if there’s a video app that isn’t iTunes, Roku almost certainly has it. And thanks to Movies Anywhere, it can access iTunes movies, too. It’s also worth mentioning the exclusive Roku Channel app which has a bunch of free on-demand movies (with ads). The selection is a lot better than you’d think, and the ads aren’t that bad, although you might have to put up with some awkward breaks. As usual with Roku, apps launched quickly and performed well. I also appreciated that the TV, unlike cheaper Rokus like the Express, can connect to both 2.4GHz and 5GHz wireless networks. Search is the best in the business overall, and in general the interface is as friendly and simple as it gets. For more info, check out my review of my favorite Roku device, the Streaming Stick Plus. Since Roku TVs launched in 2014 owners of even the earliest models have received all of the latest software updates, many of which add really cool features. Last year came private listening to TV audio via headphones plugged into your phone, for example, as well as the ability to pause live TV from the over-the-air antenna. To do so you’ll need to plug in a USB drive; the $5 Sandisk Cruzer I tested worked great. The latest update brings the best antenna-based extras yet. There’s now a full grid-style program guide that lets you easily check what’s playing now and in the future, but Roku did something really novel with the listings. On shows marked with a purple asterisk in the Guide, you can hit the asterisk key on the remote to summon a page labeled “More Ways to Watch.” It shows which streaming services carry that show and episode. Select one and it begins streaming from the beginning. How cool is that? I tested a late build of the feature on the 32-inch S305 and it worked great. The numerous asterisked shows each allowed me to click through and choose another streaming episode to watch immediately. Clicking one popped me out of the antenna and into s choice of where to stream. “The Bold and the Beautiful,” for example, let me choose from the CBS All Access or Spectrum apps, while “A River Runs Through It” (the Redford movie) let me choose from The Roku Channel (free), Amazon (free with Prime), Vudu or Google Play ($3 each). In addition to the new guide and More Ways to Watch, Roku’s latest TV update adds rudimentary voice controls for commands like app launching, switching inputs and tuning to an antenna channel. Since the S305 lacks a voice remote, however, they’re only accessible via the Roku app on your phone. In their best default settings for a dim room, namely Darker brightness and Movie mode for the Roku TVs, none of the models in my lineup stood above the rest. Color on the 32-inch S305 was a bit greener than the others, but not terrible. 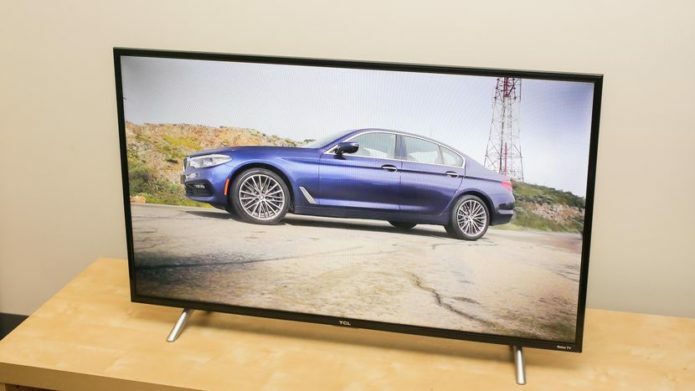 The 43-incher looked better than the 32 overall, with deeper black levels on par with the 40-inch set from 2015 and better than the other sets in the lineup — including the 4K models. Both of the S305 models could get plenty bright for most lighting situations. The 43-inch was the brightest in the room after the Element, clocking 333 nits in its brightest setting (Brighter brightness, Vivid mode), and surprisingly to me the 32-incher was not the dimmest. It delivered 240 nits, brighter than the Insignia at 213. Screen uniformity on all of the samples was fine, with no massive bright spots or imperfections. All showed some level of brightness variation, as I’d expect and forgive at this price level. Last year I had smaller Vizio sets on-hand and TCL’s models performed noticeably worse. This year I didn’t have ay of those Vizios to compare, but I doubt the difference would be as stark. That’s because Vizio removed true local dimming from its smaller TVs for 2017, further leveling the playing field among bedroom-size sets. Roku and an affordable price is a potent combination in a small TV. The S305 will be very similar to any of the other Roku-braded sets from other makers, including Philips, Insignia, Sharp, Hisense, Hitachi, RCA and more, but TCL is often the least-expensive of the bunch and therefore the best value. The exception is the 49-inch 49S305. That set is just $10 at press time than the 49-inch S405 model with 4K resolution, and while those extra pixels will be tough to discern, I’d still pay that much extra to get the 4K set. At 43-inch and smaller, however, the S305 is king.